Empanada is of Spanish origin and actually it means “meat pie” in Spanish. There are many variations of empanada all over the world and this Filipino beef empanada we are enjoying is just one of them. There are also variations of vegetables and meat used in making empanadas. Making empanadas is not as hard as you think. You don’t even need an oven to make one. Just a deep frying pan will do. Making the dough is also simple and does not require you to knead it. To make beef empanada; Fry the potatoes until golden brown, then set aside. Saute the garlic and onion for a minute, then add the beef and stir fry for a few minutes until almost fried. Add the bell peppers, and season with salt and pepper. Set aside and cool down completely. Cut the dough into approximately 1/3 cup measure, roll like a ball. Flatten each ball into 5 inch diameter circle and fill the top half with 1 1/2 tablespoons beef filling. Fold the bottom half over and seal the edges using a fork. Do the same thing on the rest of the ingredients then refrigerate for few hours. In a deep frying pan, heat up cooking oil, and deep-fry the empanada until golden brown. Fry the potatoes until golden brown, then set aside. Saute the garlic and onion for a minute, then add the beef and stir fry for a few minutes until almost fried. Add the bell peppers, and season with salt and pepper. Set aside and cool down completely. To make the dough, mix all dry ingredients together: flour, sugar and salt. Mix in the shortening, continue mixing until the mixture is uniform in texture. Mix together the eggs, vinegar and cold water. Add into the flour and shortening mixture. Mix together until smooth, do not knead. Then wrap in plastic sheet and refrigerate for 30 minutes or until ready to use. To make the empanada : Cut the dough into approximately ⅓ cup measure, roll like a ball. Flatten each ball into 5 inch diameter circle and fill the top half with 1½ tablespoons beef filling. Fold the bottom half over and seal the edges using a fork. Do the same thing on the rest of the ingredients then refrigerate for few hours. In a deep frying pan, heat up cooking oil, and deep-fry the empanada until golden brown. 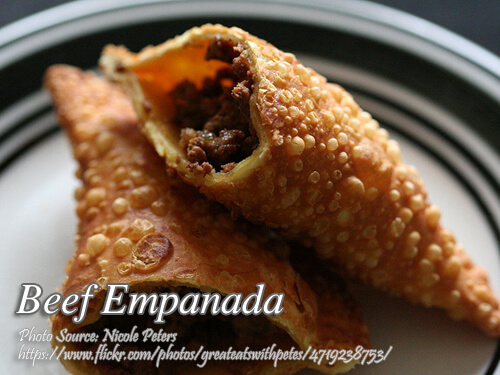 Thanks for sharing this beef empanada recipe! I’m going to try this tonight! Cheers! Hi Alden, thanks also for visiting this blog!